The purpose of the survey is to gather the distribution of the trees in a public park including their height. We need also to get at least one picture for each asset. To add new fields ‘Species’ and ‘Height’ we need to edit the attribute properties. Please choose the recently added set and click the ‘Pencil’ icon from the context menu. Please add few species to the attribute – defined values will be then displayed within a drop down list when ‘Add Point’ button is pressed. On the ‘Add Field’ screen we can also add a so called ‘Scalar field’- it will be displayed as a free text – or Yes/No spinner. The ‘text field’ can also have a default value. This value will be set automatically when ‘Add feature’ button is pressed. At this point the attribute set is ready to use. To start the survey we need now to create the survey layer and set the default attribute set. To add a new layer and use it to collect the survey information please go to ‘ Layer Management‘ and press ‘Add Layer‘ button. When setting a layer name it’s highly recommended not to use special characters like: / \ ? ‘ ; : ” | . , ^. The layer name is used to create e.g. a ‘pictures’ sub-folder in MapIt → Pictures and these special characters may cause problems on certain devices. Similarly the layer name is used to name the file during an export operation and some special characters may cause problems as well. The advice is to use alpha-numeric strings with spaces, dashes or underscores as delimiters. Set the default attribute set – if you leave it as ‘None’ you will be able to create points containing only the name and a description. When adding new layer you can also set the new layer as active or choose a field for labels when the checkbox ‘Show labels’ is checked. You can also choose colors for new markers or lines or set outline color and fill for polygon geometry type. Some Layer properties can be changed later, however layer name, attribute set and geometry type can be set only during create layer operation. When there is an active layer you will see a screen containing dropdown lists for the preset attributes each time you press the ‘Add Point‘ button when collecting the data . 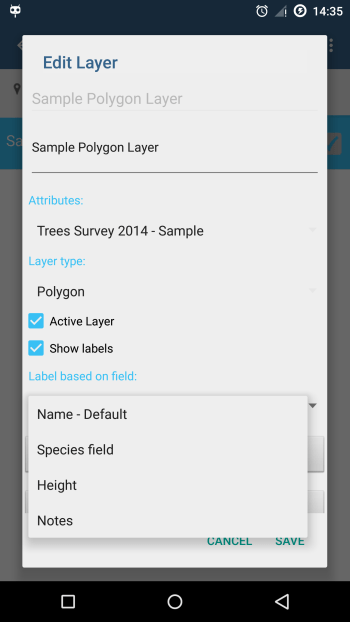 When the survey is finished you can export your data to SHP files, CSV, KML, geoJSON, ArcGIS JSON, DXF (Geometry Only). Exported data will be saved to SD Card. Moreover they can be shared using a number of standard ways including e.g. Email, GoogleDrive and Skype. Sir, when I go to export layers I go to manage layers, select layer to export, then select the place to export to, but when i choose tge file format for export (kml, geo json, etc) I get a message saying sorry that Mapit has quit working. Tried many times with same results and cannot export my data. Some help would be much appreciated. Hi David, can you send me an email – I will try to resolve your problem, but need to discuss it in more details. I would appreciate if you can share your database (backup management) with steps how to get to the crash. Thanks for tge reply…My email is daveydoubleclutcher@gmail.com. I did not buy MapIt pro, only bought the two extensions I thought I needed, so I’m assuming I’d have to buy more to use backup management feature and to get you the database you requested. Hi! I wonder if there is any plans to extend the possible settings of coordinate systems, and export files? I find MapIt Pro easy to use and suitable for smaller archaeological surveys but find it problematic to use because it doesn’t fit with the standard coordinate system in Sweden (Sweref 99) and it would been great if it was possible to export into shp-files. I will have a look at Sweref99 and see if I can add it in the near future, however it is easy enough to export the data to ArcJSON for direct import using geoprocessing tool to ArcMap, or to geoJSON for qGIS and do necessary coordinates conversion using desktop software. You can also use http://ogre.adc4gis.com to convert geoJSON to SHP if you need to work with this file types. The program is very good except for the fact that I can export the map to any other program! Is there a program for word I can use and Google maps is rubbish and a screen shot is not big enough. Hi Caine, I belive the resolution of the screenshot vary from device to device. The screen shot option was added only as some users needed that function to be able to quickly share whatever they had on the screen, however is not a main MapIt function. If you need high quality printing you probably need to export your data to formats like geoJSON, KML etc. end get it post processed in a PC environment like ArcMap or qGIS and do better quality printing from there. Gis will work when I’m at the location but when I typed the addresses in it tells me their is no address can you HELP? Only addresses available in OpenStreetmap Nominatim are supported. The tool generally allow to search for places and coordinates in lat,lon format rather than particular addresses. I tried it both ways: EPSG: 3517 & just 3517. Seems to work either way! Hi Bruce, since version 4.6.5 numeric values only are supported as well for providing the custom EPSG code. Is there a way to enter coordinates to find points I have known coordinates for? Hi James, just input the coordinates in lat, lon format (decimal) in the search box (the same as for search for place).